Our Projects - Professional Jamaicans for Jamaica, Inc.
Professional Jamaicans for Jamaica, Inc. has established a National Education Program (“NEP”), an initiative designed and structured to propel the education system of third world countries. This will be one of the main long-term goals of the organization. Our mission is to address the economic and education needs of children who are challenged socio-economically and socially and to build leaders who will shape the future of our nation, with an unfaltering commitment to inspire the same in their successors. Since our establishment, our organization has implemented various projects to aid needy children and is fully committed to initiate additional projects in near future. Professional Jamaicans for Jamaica, Inc. scholarship competition is geared towards less fortunate students to offset their education cost. Quality education will always have costs involved; teachers and other educators will need to be compensated for their time and efforts, and certain disciplines require expensive, specialized equipment to train students. Professional Jamaicans for Jamaica, Inc. established a scholarship competition in 2010 for deserving students attending high schools in Jamaica. The scholarship offered is an essay-writing competition named in honor of Ms. Esmie L. Walters, a typical Jamaican mother who committed her life to her children; she withstood the trials and tribulations as a single mother, nurtured her children with all her love, and constantly reminded them of the importance of education. Our organization has now established a scholarship to provide financial assistance to students pursuing tertiary level education. We are cognizant that students will require funding to complete the education process. 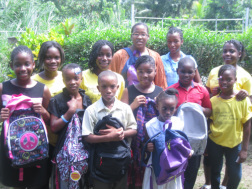 Professional Jamaicans for Jamaica, Inc. host an annual “Backpack Project”. This annual campaign invites members of our communities to donate basic school supplies which is provided to children from low-income communities who would otherwise return to school without them. School supplies received from members are distributed to children in various locations in Jamaica. Our goal is to help impoverished communities in Jamaica with much-needed school supplies to ensure our students complete the education process. Professional Jamaicans for Jamaica, Inc. “Breakfast Project” is aim to provide an incentive for the less fortunate students in schools. 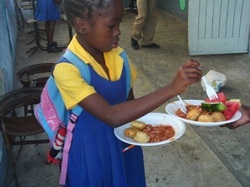 The Breakfast Project was first established at Trench Town Primary School on Friday, February 18, 2011; serving 76 students (approximately 42% of the student population). Studies have shown that access to nutritious programs such as the School Breakfast Program helps to create a strong learning environment for children and helps to improve children’s concentration in the classroom. Providing breakfast in the classroom has been shown in several instances to improve attentiveness and academic performance, while reducing tardiness and disciplinary referrals. Students who eat a complete breakfast have been shown to make fewer mistakes and work faster in math exercises than those who eat a partial breakfast. Studies also suggest that eating breakfast closer to the classroom and test-taking time improves student performance on standardized tests relative to students who skip breakfast. Professional Jamaicans for Jamaica, Inc. “Christmas Treat” is aimed to bring joy and smiles on the faces of the less fortunate children in Jamaica. Christmas is a time for sharing with others and our organization want to ensure the less fortunate children appreciates the gift of Christmas with a treat of ice-cream, cakes, and toys for all gender. There are no limitations to the areas we serve; we anticipate sharing the joy of Christmas with children in the fourteen parishes of our beautiful island, Jamaica. Through fundraisers and donation drives, we gather as many toys to distribute in various locations in Jamaica, coupled with the serving of ice-cream and cake. Our organization is committed to each and every project we launch and will ensure "failure is not an option" as we continue to work on behalf of the success of Jamaica and Jamaicans.